Background Pancreatic cystic lesions represent a diagnostic dilemma as some may harbor malignancy or have potential for malignant transformation. 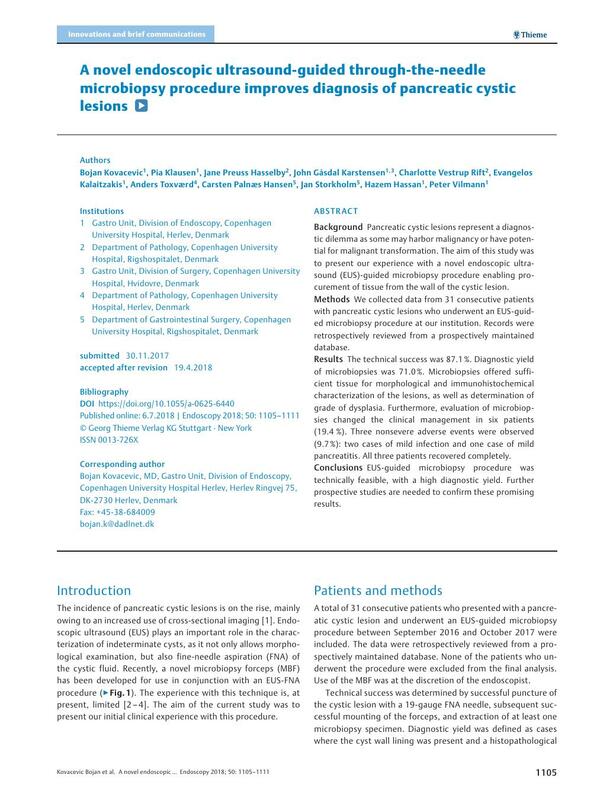 The aim of this study was to present our experience with a novel endoscopic ultrasound (EUS)-guided microbiopsy procedure enabling procurement of tissue from the wall of the cystic lesion. Methods We collected data from 31 consecutive patients with pancreatic cystic lesions who underwent an EUS-guided microbiopsy procedure at our institution. Records were retrospectively reviewed from a prospectively maintained database. Results The technical success was 87.1 %. Diagnostic yield of microbiopsies was 71.0 %. Microbiopsies offered sufficient tissue for morphological and immunohistochemical characterization of the lesions, as well as determination of grade of dysplasia. Furthermore, evaluation of microbiopsies changed the clinical management in six patients (19.4 %). Three nonsevere adverse events were observed (9.7 %): two cases of mild infection and one case of mild pancreatitis. All three patients recovered completely. Conclusions EUS-guided microbiopsy procedure was technically feasible, with a high diagnostic yield. Further prospective studies are needed to confirm these promising results.